Could someone post a shot next to a truescale Warlord for modern comparison? I may be wrong, but I think the "truescale" model that's floating about may also be a touch too big? 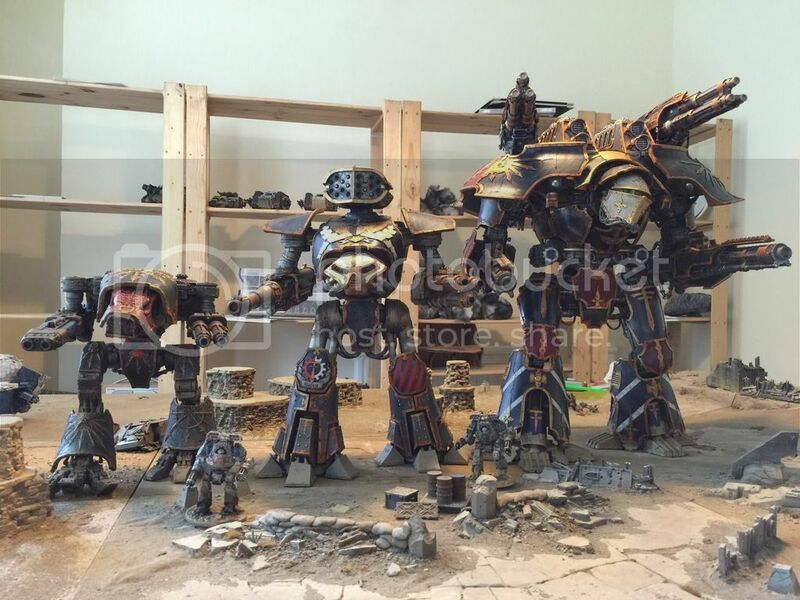 That's just from eyeballing it in pictures, but it looks like it might be larger in comparison to a medium titan than their 40k equivalents size up to be. this is why the 'truescale' moniker annoys me so much, what are the models 'true' to the scale of? is it the 40k models? is it the published sizes in the IA book (available on lexicanum) are they 'true' scale at 1:300 or 1:285? what scale actually is GW? 28mm? 32mm? inconsistentmm? Yeah it was designed to match the height. My issue us that the Lucius style is a bit top heavy so I think this is a wee bit over sized. Not enough to ruin it but would like it shrunk by 8-10% for my own tastes. Thanks for the measurements and Photoshop chaps. The standard for 'truescale' I always took to be the one Forgeworld developed- a 1:5 reduction from the 40k models, which therefore assumes 40k to be a 30mm scale game. That's what they used for all of their epic and AI models, except the titans. 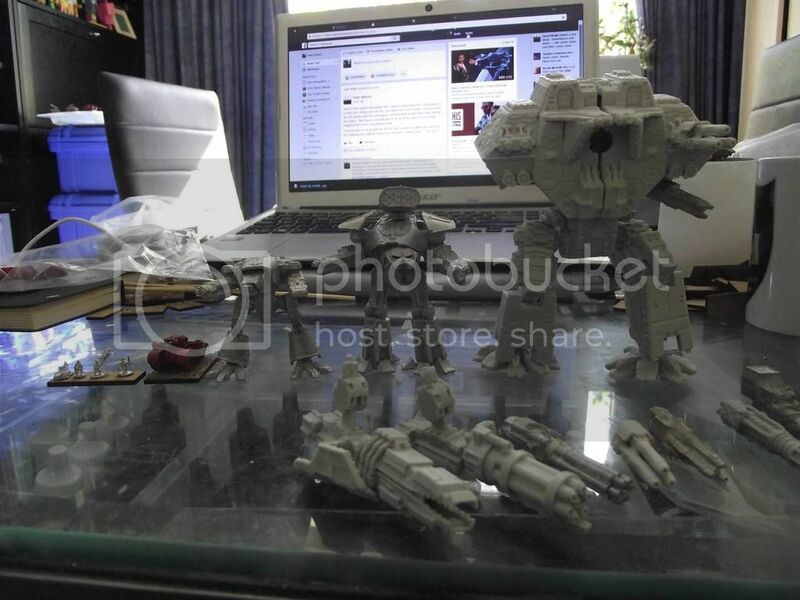 Well this will help the warbringer is gigantic and I feel that both these models are over scaled next to the old true scale reaver and warhound models by about 10 to 15%, if you look at the actual FW 40k models side by side for comparison. In fact these over scale models would most likely be a better fit for AT 2. As can be seen my leviathan no longer lives up to the name next to these monsters. Nice model. If they ever do a 50% smaller version i might even get one. :-) Still think the head is a bit odd but looking forward to seeing one painted. 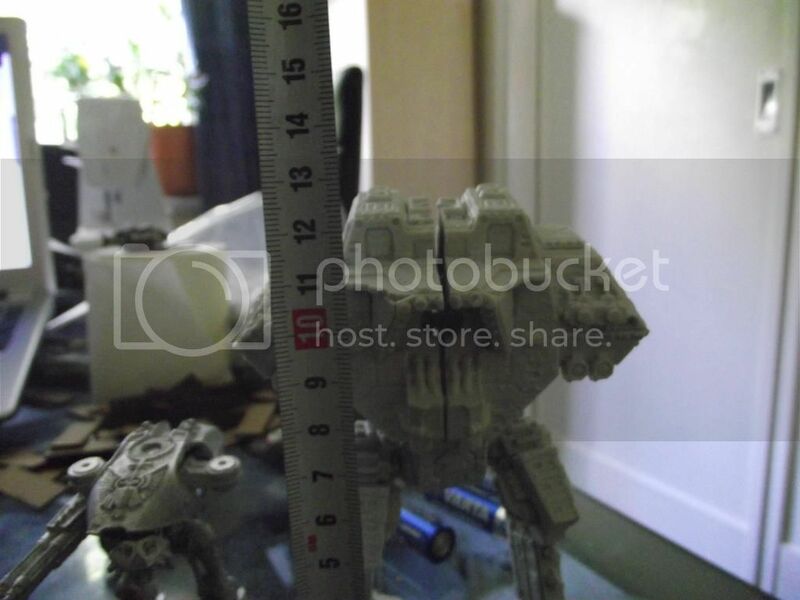 Ah, so that is why the resin FW true scale epic is so much smaller than GWs own untrue scale Epic? I always thought true scale meant embiggenment. It's a shame the two are a little oversized, but it doesn't bother me all that much really and I've got/ordered one of each so far. I agree that the old Leviathan does look skinny and feeble looking in comparison. I'll just sell mine on at some point. Hmm... Bit busy - seems like cut and paste overkill on the details. Guessing the superstructure silhouette is unfinished. Has potential though. I agree. The repetition of surface tiles looks like wallpaper. Nice pose and design though! On the other hand embiggenment is annoying. That said they're probably re-using bits to save design time and they're partly making the models with cut foam wih 3d printed bits on top, presumably to save money. This is true for their 28mm titans as below anyway (they're doing them in both scales), they may be pure 3d printing their 6mm versions. I view the 'Warbringer' as ok but not great and the Emperor class as quite poor design wise, but still the best truescale titan until when/if anyone else comes out with anything better. I guess that's a good enough reason to start developing some bigger Stalkers. I guess your Leviathan would be akin to a 'light' version of a Warlord proxy, like the old Eclipse Class Titan?